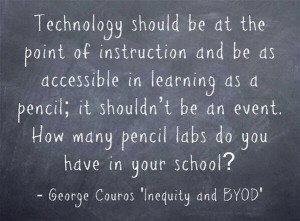 In a recent post in his Myths of Technology series, +George Couros wrote about the idea that ‘technology dehumanises’. In this piece, Couros suggests that it is a misnomer that technology is anti-social and takes away from our relationships. Instead, technology actually provides the potential to amplify our relationships. Rather than technology, Couros posits that “people dehumanize one another, not technology”. This got me thinking about a point +Doug Belshaw made in his book ‘The Essential Elements of Digital Literacies’ that digital literacies are at there heart social. In a presentation for Promethean, Peter Kent put forward that interactive whiteboards offered an opportunity to modify the way we teach and the way students learn. Instead of merely using the projector to provide information, the interactive nature of the boards allow students to come up to the board and engage with information and ideas, providing the opportunities to build further conversations and opportunities. For a further explanation, see my post ‘Sum of the Parts is Different to the Whole‘. What I find most interesting about Kent’s idea though is that this focus on the use of technology to instigate conversations goes far beyond the interactive whiteboard, it can be applied to just about any technology. For example, this year I have taken to using an iPad to help model and manipulate ideas during intervention sessions. Teaching in a space with only one interactive whiteboard between three classes, I have started using the Inkflow app by Grayon on the iPad to get students to visually demonstrate understanding. Instead of getting them up to the board, the device goes to where they are. Using the iPad in this manner has allowed students to both create and comment on ideas. Another example of where I have used iPad in a social manner lately is through the a series of games from Toca Boca with my daughter. Whether it be Toca House, Toca Doctor or Toca Band, the Toca Boca games provide a stimulus for some great conversations, such as discussing recycling fruit, killing germs in the mouth while brushing our teeth or the different instruments involved in a band. Although it is possible to play these games in solitude, they are not the same. Even if the conversation is later on, they provide the stimulus for so much more. 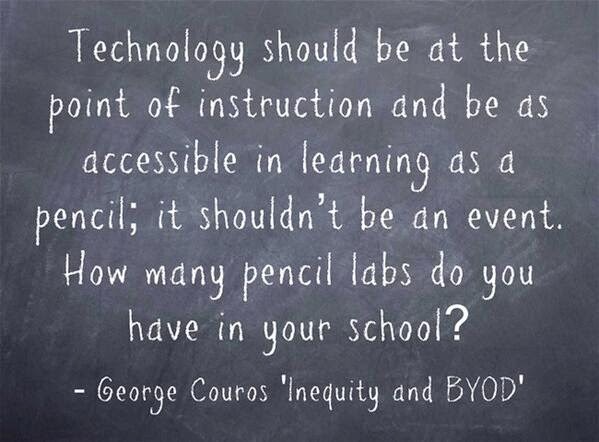 In another post exploring BYOD, Couros questions why we still depend upon booking time in labs in order to get access to technology in the classroom. Instead, he argues that BYOD initiatives offer the opportunity to have technology available where the instruction is. The myth therefore that technology dehumanises often starts when we see technology as an event. The human side is taken away, because instead of being incorporated into the lesson, technology becomes the sole focus of the lesson. What is interesting about Couros’ message is that technology has the potential to either amplify and augment our interactions or to kill them off all together. In the end, it is us who have the final say. So how are you using technology today? Repositioning the Use of Technology in Schools by Aaron Davis is licensed under a Creative Commons Attribution-ShareAlike 4.0 International License.